As the best coffee suppliers London for a wide range of espresso-roast coffee beans, cafetiere grind coffees and fresh filter coffees, we can supply samples or a tasting at our central London coffee school as well as a broad range of coffee machines; call us on 0203 096 7233 or visit our Clerkenwell coffee machine showroom near Barbican station. Our broad range of 8 different espresso roast coffee beans is roasted and packed at an advanced facility in the UK to the highest standards and our exact specifications, batches of roasted beans are sometimes rejected as being not the perfect roast shade or to the satisfaction of our experienced team of production specialists and Q Graders. Our coffees range is a bit like a paint-mixing machine at B & Q – which exact shade would you like?! 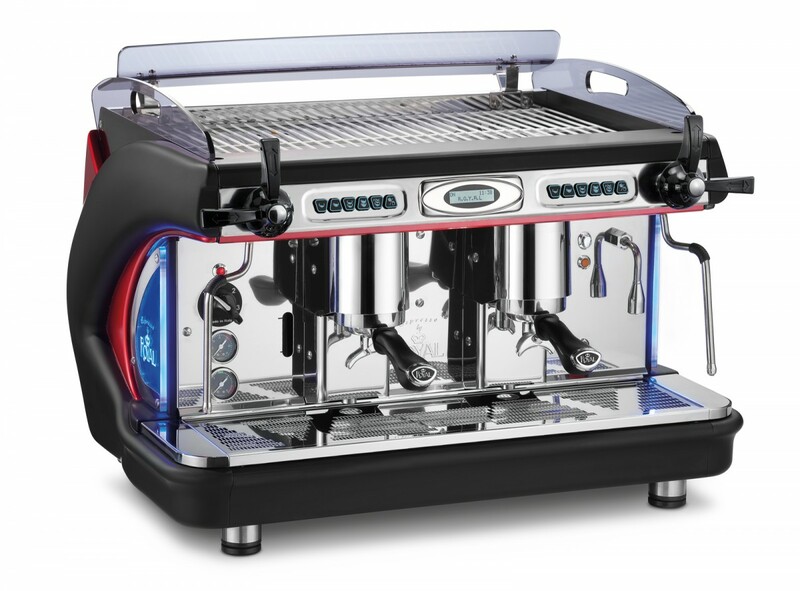 The range is wide to cover the varied tastes and demands of the espresso coffee market; questions include: Do you have a traditional espresso machine and barista/grinder? 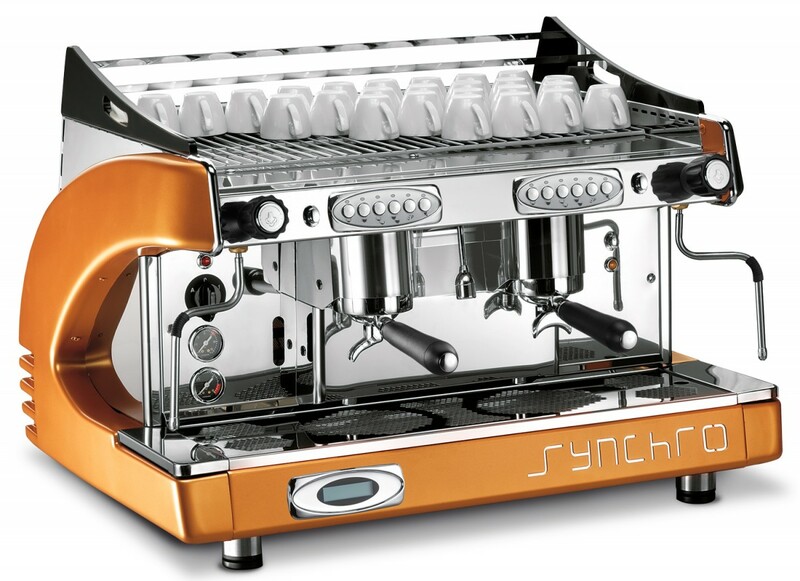 Do you have an automatic bean to cup coffee machine? Do you have hard or soft water? (generally hard in London, Essex and Kent). What is your price point for selling a flat white? Do you even sell? A lot of coffee beans are used in London offices where no charge is made, this is all relevant to your choice of coffee and machinery. The most popular selling coffee bean is our Espresso Crema, this combines slightly above medium roast which a truly compelling Italian-style blend of beans (there’s 6 components) that is excellent for all forms of hard or soft water, performs across traditional 2 groups and Jura bean to cup and is well priced. Moving away from this blend we have the stronger Espresso Royale then our ‘fine-dining’ duo called Espresso Fino and Espresso Supremo, both superb coffees for top end restaurants, hotels and outlets in search of the deluxe espresso taste. Try our Espresso Trios – it’s the most popular of our 3 ‘ethical’ certified coffees and is a single-origin 100% Arabica coffee with Fairtrade, Rainforest Alliance and Organic certification, we also stock Espresso Amazone Rainforest Alliance and Java Organic Fairtrade beans. 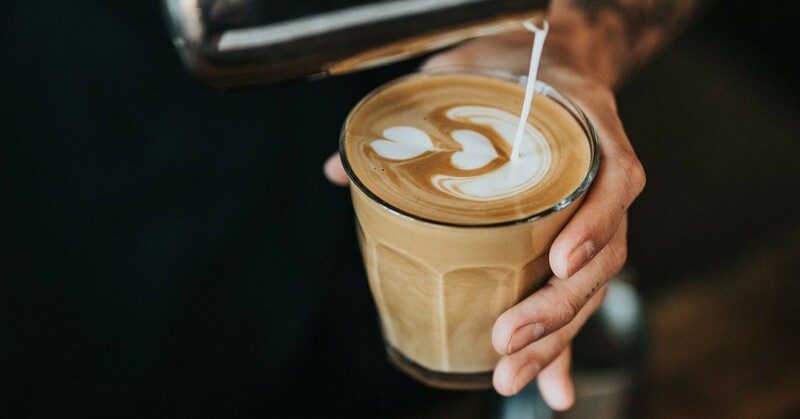 As best coffee suppliers London it is really important to remember filter coffee and again, we stock 8 different types of coffees, and they are in the most convenient format imaginable for both offices and caterers. How many times have you spooned out coffee from a supermarket packet are got varied results?! Forget it! Having filter coffee in a 3 pint portion sachet means you have just exactly the correct amount for 1 jug or flask and in our range we have 45 sachets per case and 50 filter papers. Our filter coffees range includes classics like Fairtrade Colombian/Costa Rican, our personal favourite in the office and 7 others like Traditional Blend, South American Blend and El Salvador Monte Sion single-origin 100% Arabica coffee which is also Rainforest Alliance certified – ask us for samples today. Caffia Coffee Group stock 2 main coffees in bulk 500g format for spooning into cafetieres, this is at a coarser grind than filter coffee and our Mochatalia is an absolute classic; lacking acidity but full of rounded and mellow flavour this is perfect for guest houses and hotels in London. We also offer cafetiere ground coffee in 2-cup (16g) portion sachets as Colombian, Decaff and Fairtrade in the perfect portion size for 2-cup cafetieres. 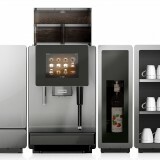 Have you called in to our central London showroom of professional coffee machines? We have something for everyone from 2 group espresso machines, coffee grinders, Franke and Jura bean to cup machines and of course lots of coffees available to try! See our address and details below if you would like to brush up on your barista skills. Coffee suppliers London-based Caffia Coffee Group offer a wide range of the best coffee beans for espresso and fresh filter coffees in vibrant branded packaging – ask for a sample or visit our London Coffee School and commercial coffee machine showroom in Gee Street, Clerkenwell, close to the Old Street roundabout. Let us guide you through the wonderful world of Arabica and Robusta coffee beans, blends and pures, grind settings for cafetiere, filter coffee and espresso and the ethical trading of Fairtrade coffees, Rainforest Alliance coffees and Organic coffees – we offer it all..
One of our most popular blends is Caffia Espresso Crema beans – a mellow and rounded blend of specially prepared coffees from India and Africa; typical of the Southern Italian taste with softness and hints of butter and chocolate yielding a classic ‘velvet swallow’. Caffia Coffee Group espresso coffee beans reflect our years of experience and mastery of complex blends and roasts ensuring you the perfect taste every time. 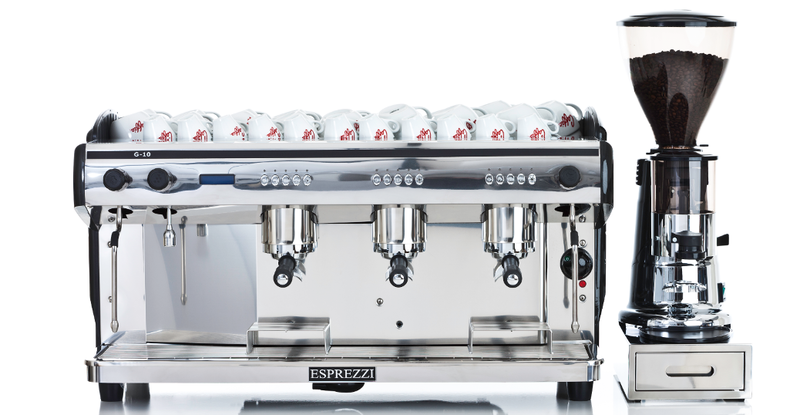 Delivering the ‘velvet swallow’ espresso with a taste profile to match your exact aspirations takes a carefully crafted range of coffees, barista confidence through training and good coffee equipment. You can rely on Caffia Coffee Group for all three. Our Espresso Trios beans are a pure single-origin Arabica coffee with 100% Fairtrade, Organic and Rainforest Alliance certification from Honduras, it is a favourite with London offices after the best coffee supplier and also with farm shops in Hertfordshire. These espresso coffee beans are roasted to perfection ,a little darker than some; this is the ultimate gourmet choice in ethical espresso beans which is very popular across a broad range of customers. Caffia espresso coffee beans reflect our years of experience and mastery of complex blends and roasts ensuring you the perfect taste every time. We have a total of 6 other blends of espresso beans. Our range also has 8 types of filter ground coffee in portioned sachets packed with basket filter papers for double jug coffee machines; the coffees that we offer include Traditional Blend, South American Blend, El Salvador Rainforest Alliance certified and Fairtrade Colombian/Costa Rica which is very popular as an office coffee product for London and the south east. Why not ask us for samples of filter coffees today? Coffee is one of the largest traded commodities in the world; second only to oil in size; over 20 million people around the world work in the global coffee trade! Green raw coffee beans and spices were traditionally landed in the London Docklands and Wapping area and roasted there as well. 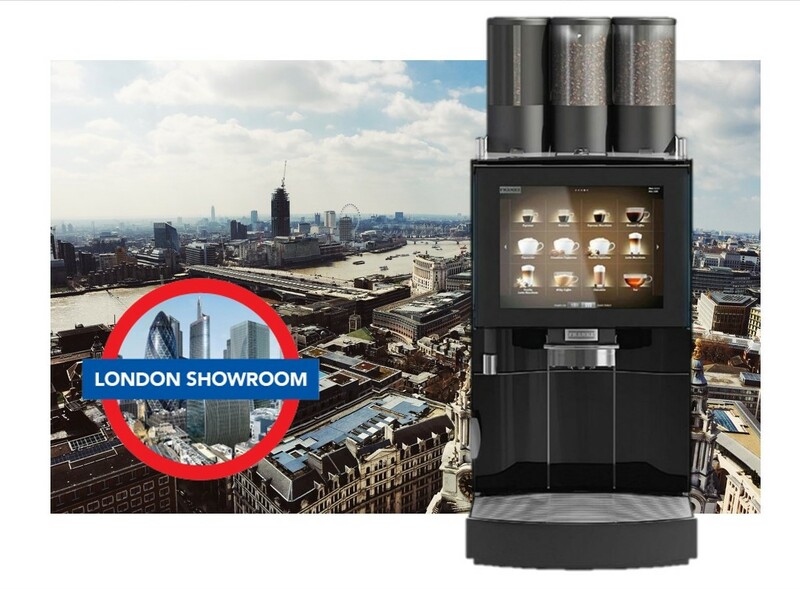 Our London Clerkenwell coffee machine showroom at the Design Hub is one of the most exciting developments of recent years, call us on 0203 096 7233 or come along to 47 Gee Street, London, EC1V 3RS to see our range of professional bean-to-cup machines and espresso machines. 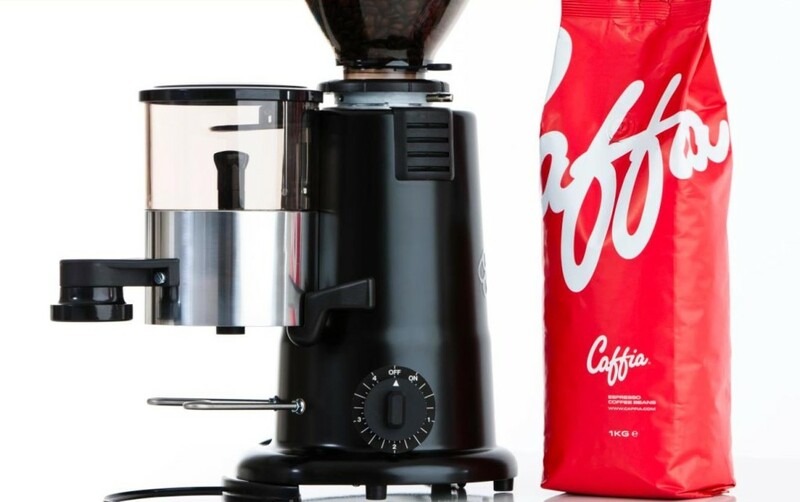 Caffia Coffee Group is a British success story in pragmatic, outward-looking coffee and commercial coffee machine expertise embracing global taste styles and in-depth coffee and equipment knowledge in a progressive way that few others can lay claim to. 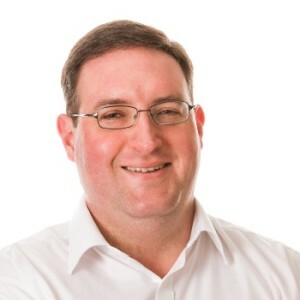 We’re also a dynamic family business offering a range of commercial coffee machines, bean-to-cup systems and grinders for offices, boardrooms and businesses. 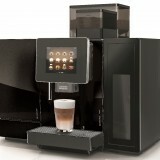 Please see the office coffee machines page for more details. Do you work in a restaurant, coffee shop, hotel or golf club? 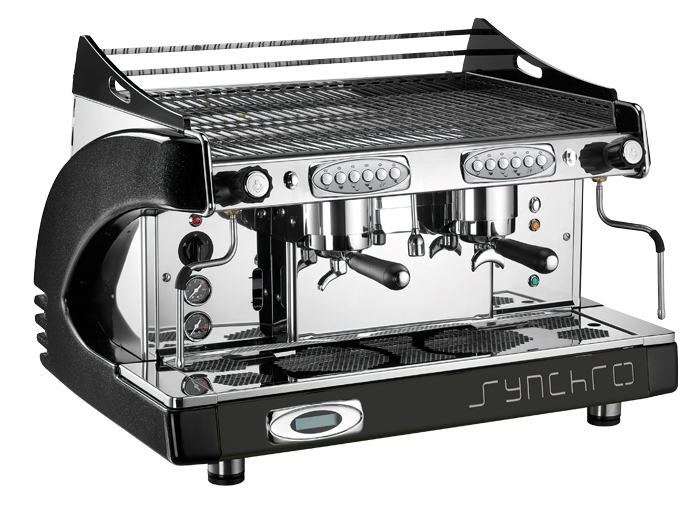 We offer an extensive range of professional coffee equipment for these types of outlets – you can see more details here. Our super-modern coffee roastery, strict quality control, research lab and training showrooms are just the final stages in a long and fascinating journey bringing this marvel of nature from the tropics to your cup. 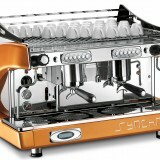 Caffia will create the ultimate coffee experience for you. See the showroom position on Google Maps. Call us on 0203 096 7233. Gee Street is near Barbican, Old Street and Farringdon stations. Jura Descaling Tablets are used for periodic descaling (decalcifying) of Jura Bean-To-Cup coffee machines; Jura is a Swiss brand of automatic bean to cup coffee machines offering touch-button convenience for drinks made from fresh beans and fresh milk. 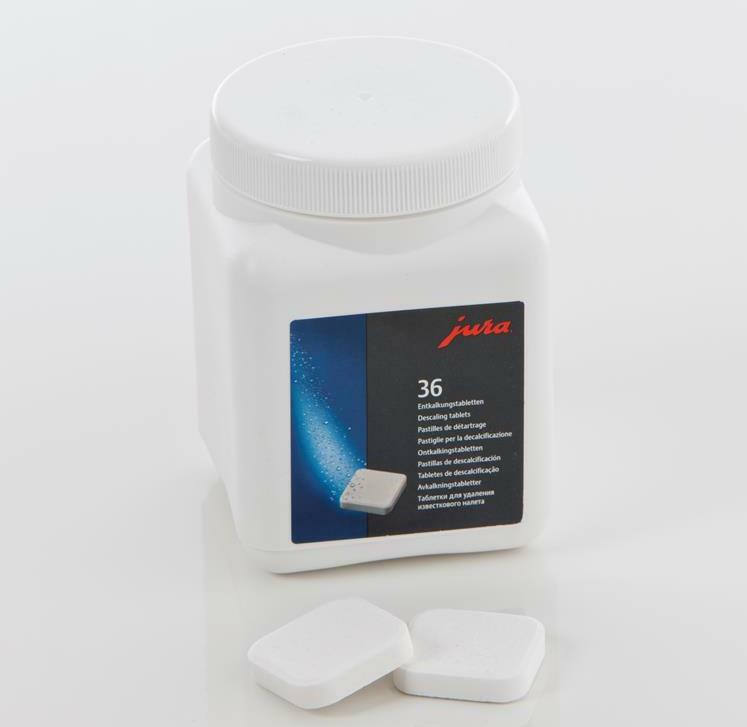 For more details on Jura Decalcifying Tablets please see our main website here where you can also place an order for these tablets, coffee beans, teas, hot chocolate and paper cups. 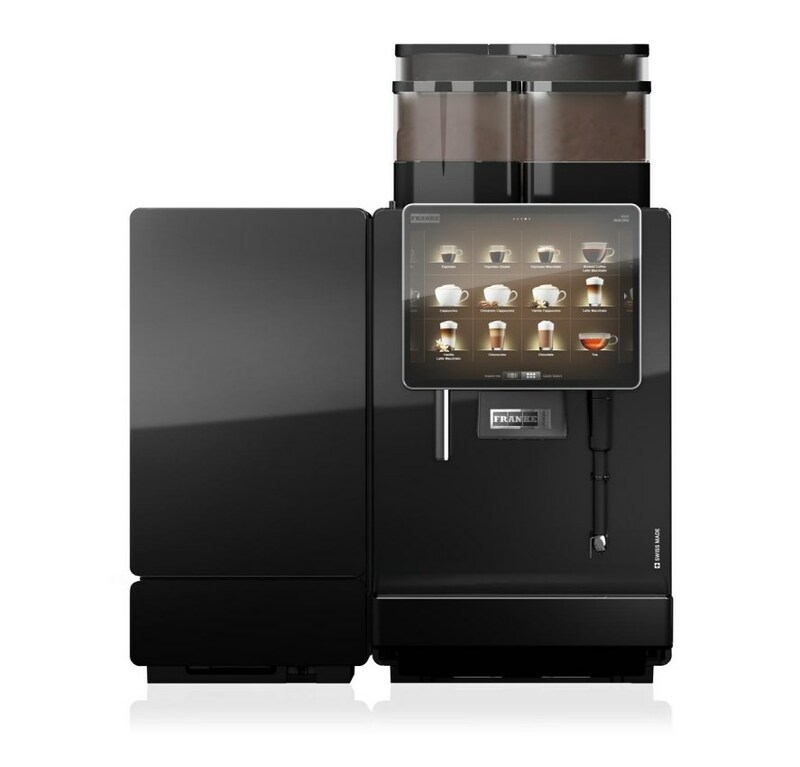 Please see the sheer range of commercial bean-to-cup coffee machine that we offer at the Equipment part of our corporate website.